It's Friday and therefore time for a pop quiz (does that line give you a fearsome flashback to your school days?). 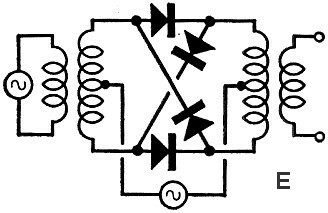 Whenever I have one available, I like to post quizzes from vintage electronics magazines, like this one on diode circuit functions. Many of them have vacuum tubes, but this one has the solid state symbols so the under-40 folks won't be uncomfortable. Your job is to look at the diode circuits and match them with the names of the functions. A couple of them will probably cause some head scratching, but you should do well. 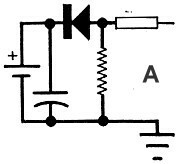 Don't jump to a quick conclusion with circuit "E" without noticing the two signal generators attached to it. 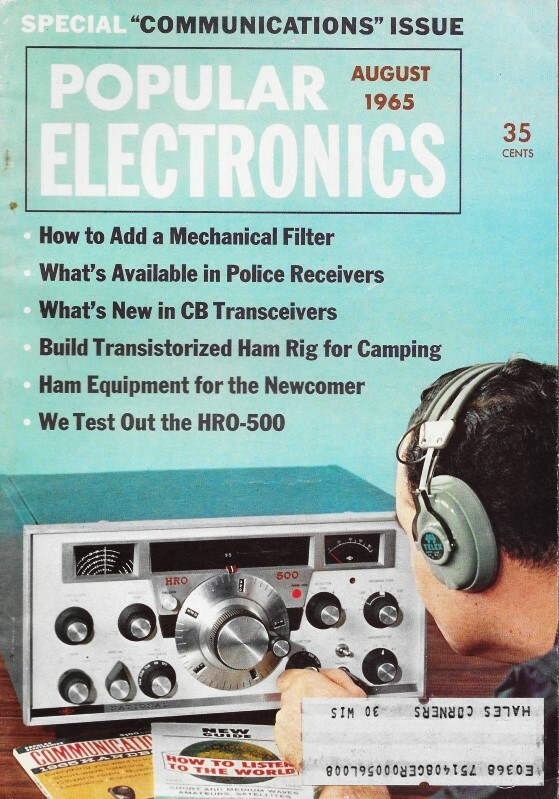 If you like diode quizzes, here is another from the July 1961 issue of Popular Electronics. The versatile semiconductor diode serves in many different ways in electronic circuits. 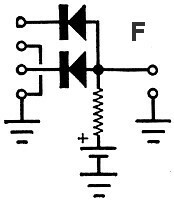 See if you can match the diode functions (1-10) listed below with the commonly used circuits (A-J) illustrated. 1 - H In a positive clamping circuit, diode conduction during the negative half cycle permits the capacitor to charge up to a voltage nearly equal to the peak value of the input signal, but the output is zero. On the positive half cycle, the diode stops conducting. The voltage across the capacitor adds to the signal voltage and the output is approximately twice the peak voltage. 2 - C A diode detector passes only one-half of the input signal's waveform to recover the audio portion of the signal. 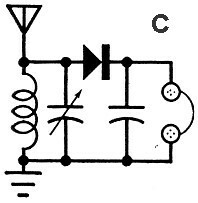 3 - F In an "And" or "Coincidence" gate, used in logic circuits, two simultaneous input signals of proper polarity and sufficient amplitude to overcome the forward bias of both diodes are required to produce an output signal. 4 - I In limiter circuits, a single reverse-biased diode can be used to clip one side of the waveform at a preselected voltage level. 5 - E In a double-sideband modulator, the carrier is suppressed while upper and lower sidebands are developed. 6 - A A small current passed through a silicon crystal diode in the reverse direction creates a noise or hiss, which can be used to test a radio receiver and other equipment. 7 - G In a Zener diode relaxation oscillator, a charging capacitor increases the reverse voltage across the diode until its Zener breakdown point is reached. The capacitor then discharges through the diode. When the diode stops conducting, the charging cycle repeats itself. 8 - D A reverse-biased Zener diode is often connected in parallel with a meter to provide overload protection. 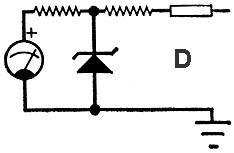 When the preselected diode breakdown voltage is exceeded, the diode acts as a shunt. 9 - B Two Zener diodes connected back-to-back are used to regulate an a.c. supply voltage by alternately clipping the voltage peaks at a preselected level. 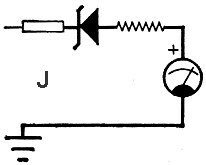 10 - J In a depressed-zero meter, a reverse-connected zener diode in series with the meter prevents any indication until the breakdown voltage is reached. Input voltages ranging from the diode's breakdown point to the meter's limit can then be spread to fill the entire scale, from one end to the other.